Previous Bits to Read had drawn out that fathers have the primary responsibility in raising their children. I want to pay attention today to the element of parenting known as discipline. How should fathers discipline their children? I raise this topic in the context of today’s North American social and legal expectations. Most of us fathers were raised with a firm hand, strict rules, a clip around the ears, and little discussion. In contrast, today’s social norms expects more hugs, much affirmation, regular encouragement, and plenty of discussion. In fact, spanking is currently against the law of the land. So young fathers experience a tension between the parenting style they have learned from their fathers and what is expected of them today. That tension results in uncertainty in how to be a father. The apostle Paul addressed the fathers of Ephesus with this directive: “Fathers, do not provoke your children to anger, but bring them up in the discipline and instruction of the Lord.” The closing phrase of that command is open to two understandings. The apostle could mean that fathers are to tell their children about the Lord. He could also mean that fathers are to discipline and instruct their children in the Lord’s manner of parenting. Both are correct. In what follows in this Bit to Read, I want to draw out the second of the two, that is, what God’s style of parenting looked like. That will be instructive for us simply because we are meant to “be imitators of God, as beloved children” (Eph 5:1). One more thing before we get into the details: the word “discipline” in that quote from Eph 6:4 should not make us think immediately of “being in trouble”. The Greek word used here is paideia, from which we get our English word pedagogy, describing the training of a youngster. You might want to think of the relation between the words disciple and discipline; both terms direct our thoughts to training, instruction, forming. 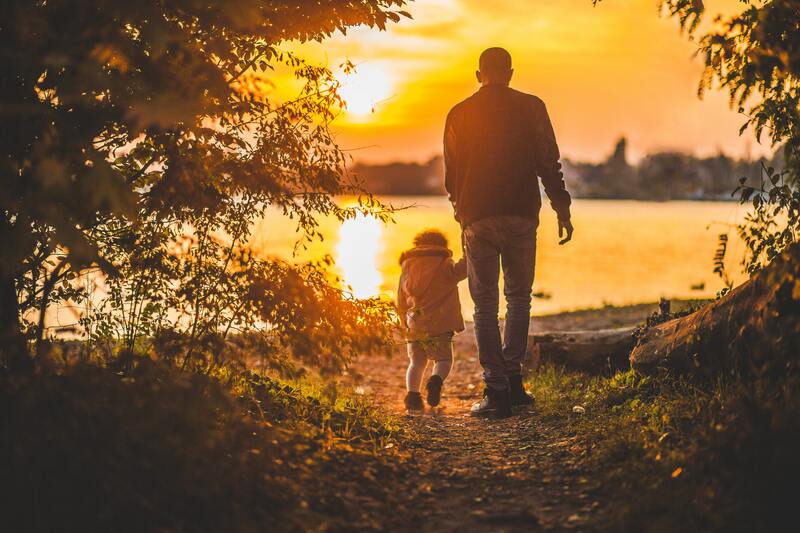 I’m going to use God’s approach to Israel as illustrative of his style of being a Father. After all, he sent Moses to Pharaoh to say this word: “Thus says the Lord, Israel is my firstborn son, and I say to you, ‘Let my son go…’” (Ex 4:22f). If Israel is the son, God is obviously the father. We can divide the material into three stages, covering infancy, childhood and teenager. In the weeks that followed Moses’ conversation with Pharaoh, this Father of Israel displayed-in-deeds for his children what kind of a Father he was (Ex 5-19). It’s not that he spared them from pain and suffering (Pharaoh made the Israelites work harder to collect their own straw, and the first plagues affected the people of Israel too), but in the land of Egypt he increasingly and deliberately made clear to his children what his care and his strength and his devotion to them actually was – so that they might learn to feel safe with him. After the ten plagues he showed them his cloud of glory, led them through the Red Sea, and on the other side he let them see the bodies of the devastated Egyptian army. In the desert he rained manna on his people day after day to feed them, provided water to drink, and defended them from the Amalekites. The point: as Israel walked the road of life, this Father daily discipled and instructed his children. And note: they received a divine tick across the fingers. He told his children to keep no manna for tomorrow (they were to trust he would supply); some disobeyed – and in the morning that manna had bred worms and stank. Ouch. The prophet Hosea described what was happening in this part of Israel’s history: “When Israel was a child, I loved him, and out of Egypt I called my son…. It was I who taught Ephraim to walk…. I led them with cords of kindness, with the bands of love…, and I bent down to them and fed them” (Hosea 11:1-4). And this Father meant it. When Moses was on the mountain to receive the Ten Commandments in written form and to receive instruction about the building of the tabernacle, the people built a gold calf and worshipped it – in direct defiance to the second commandment they’d received a few weeks ago. God’s response was a sharp spank; 3000 died (Ex 32:28). But the next morning manna lay on the ground again as he fed his children; here was his hug of love. The year Israel spent at Mt Sinai was very much a schooling for Israel, with their heavenly Father teaching, instructing, and disciplining them as they sat in their tents and walked along the way (recall Dt 6:7). In the abundance of instruction, the Bible records besides the spank at the golden calf only two incidents of rebuke at Mt Sinai; that’s the deaths of Nadab and Abihu on the day the tabernacle was inaugurated (Lev 10:1ff) and the stoning of the man who gathering sticks on the Sabbath (Lev 24:10ff). But once Israel had completed their schooling at Mt Sinai, the Lord treated them as having more responsibility. Notice the concentration of disobedience after Israel left Mt Sinai (Num 10:11ff) and God’s response to it. “The people complained in the hearing of the Lord about their misfortunes.” With a physical punishment he rebuked them for their attitude; “the fire of the Lord … consumed some outlying parts of the camp” (11:1). Again, they craved “the fish we ate in Egypt…, the cucumbers, the melons, the leeks, the onions, and the garlic” (11:4f). The Lord’s response is instructive; “while the meat was still between their teeth, before it was consumed, the anger of the Lord was kindled against the people, and the Lord struck down the people with a very great plague” (11:33). Note those last words: that’s a very sharp spank! And what shall we say of his response to their complaints about the report of the 12 spies…. “you shall remember the whole way that the Lord your God has led you these forty years in the wilderness, that he might humble you, testing you to know what was in your heart, whether you would keep his commandments or not. And he humbled you and let you hunger and fed you with manna … that he might make you know that man does not live by bread alone, but man lives by every word that comes from the mouth of the Lord. Your clothing did not wear out on you and your foot did not swell these forty years. Know then in your heart that, as a man disciplines his son, the Lord your God disciplines you” (Dt 8:2ff). Notice those last words: here is God’s style of fathering. “…they whored after other gods and bowed down to them…. Whenever the Lord raised up judges for them, the Lord was with the judge, and he saved them from the hand of their enemies all the days of the judge. For the Lord was moved to pity by their groaning because of those who afflicted and oppressed them. But whenever the judge died, they turned back and were more corrupt than their fathers…. So the anger of the Lord was kindled against Israel, and he said, ‘Because this people have transgressed my covenant…, I will no longer drive out before them any of the nations … in order to test Israel by them” (Judges 2:17ff). Notice the emotion within the heavenly Father: he “was moved to pity”. But the pity did not make God soft; his son had to lie in the bed he made for himself. The purpose was to test Israel – and the purpose of the testing was to press on his son the need to acknowledge that Father’s instruction was correct after all. In his Proverbs wise King Solomon gave considerable instruction about parenting. From where did Solomon get his wisdom about parenting? Does what he records capture the accumulated wisdom of years of parental trial and error? Not at all. As with all of Scripture, later Bible books are built on the foundation laid in earlier Bible books. Solomon was a student of Scripture, and from the Bible he had -that’s at a minimum the books of Genesis, Exodus, Leviticus, Numbers and Deuteronomy- he learned from God the Father how fathers were to carry out their fathering. That’s the instruction echoed and worked out in so many texts from Proverbs. I do not have space to work that out in detail. I would suggest Dads (and Moms of course) read through those Proverbs to glean so much guidance about what “the discipline and instruction of the Lord” sounds like and looks like. Instead, I want to summarize a number of lessons. God the Father was and is never AWOL; always he was and is a presence in the lives of his people. We say: that’s understandable given that he is everywhere present, all-seeing and all-knowing. We add: but we’re finite, can’t be at home while we’re at work, and once we’re home after a long day’s work we can’t be expected to see all that’s happening. Indeed, we’re finite. But the vital question is: are you a presence in the lives of your children whether you’re present or not? That is: does your persona impact the thinking and conduct of your children whether they are at home or at school or wherever? Are you significant in their lives or insignificant? Precisely because we fathers are to image the Father (we share his title for a reason!) we need to labor to be an abiding presence in the minds and lives of our children. That starts when they’re still in the cradle; we spend time with the little ones, work with them and play with them, and show them in endless ways that they are precious to us. Our little ones are bent to do evil from the start, yet it’s through our being a presence in their lives that they learn subconsciously to factor us into their attitudes, decisions and conduct. Our heavenly Father is deeply patient with his sinful children. Though in the face of his holiness they were rebellious, sullen, and profoundly selfish, he kept on caring (giving manna, judges), teaching (think of Moses and the prophets), training in the school of life, and ultimately giving his only begotten Son to adopt the undeserving into his family. Again we say: God can do that, for he’s perfect; we’re not. That’s true – and we end up struggling with impatience, despairing of our children, and being tempted to retreat into a mancave. But the fact is that the Lord God has renewed us by his Spirit so that we are able to produce the fruit of the Spirit (Gal 5:22f). So the question becomes: do our children see in us such fruit of the Spirit as patience, kindness, gentleness? That is, do they see us denying ourselves as we seek to answer their questions and teach them the Lord’s way? It’s essential that they do. All our teaching about who God is will gain no traction with them if they do not see their heavenly Father in us as Dads. God can be angry with his people and spank them severely. Of course, he never struck out upon his people in uncontrolled or unrighteous anger. Once more we say: he’s God, so he can control himself and discipline perfectly; we are sinners and so we lose it from time to time. Again I say: we’ve received the Holy Spirit and so are equipped to image what this Father is like. Should we spank? Yes, certainly, in its moment – and never in anger. Despite today’s accepted code of conduct, “whoever spares the rod hates his son, but he who loves him is diligent to discipline him” (Prov 13:24; cf 22:15; 23:13,14; 29:15) – as Solomon learned from his Father in heaven. As the Lord God blessed obedience and cursed disobedience, so we, as tools in his hands to show our children who he is, need to dare to reward with blessing and with punishment. We’ll need to tell our children that we’re responding to their conduct not because of forces within ourselves (or our culture) but we’re responding as we are because we dare not be wiser than the Father in heaven whom we are to imitate. So we discipline, even with tears in our eyes. Then we wrap the child up again in love and comfort. Becoming a Dad is a privilege. Being a Dad is a sanctified art; by God’s grace a father reflects the Father in his manner of parenting. It’s an incredible honor!